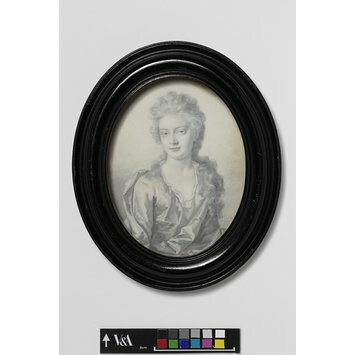 In the second half of the 17th century in England there was a fashion for small black and white portraits drawn on vellum (fine animal skin). This medium is more durable than paper. Although these portraits were called 'plumbagos', meaning black lead, they were usually drawn in graphite and sometimes in ink. This portrait is done in graphite. ‘Plumbagos' developed in the Netherlands in the late 16th century within the print trade. They developed from the printmakers’ original drawings on paper, from which a print would have been engraved. 'Plumbagos' were introduced into England when the monarchy was restored in 1660, by printmakers who returned home from exile abroad. As the taste for 'plumbagos' became established, artists who were not printmakers also began to produce them. A few artists continued the art of the 'plumbago' into the early 18th century. We know very little about Thomas Forster, but he was clearly a talented 'plumbago' artist. His portraits date from between 1690 and 1713. 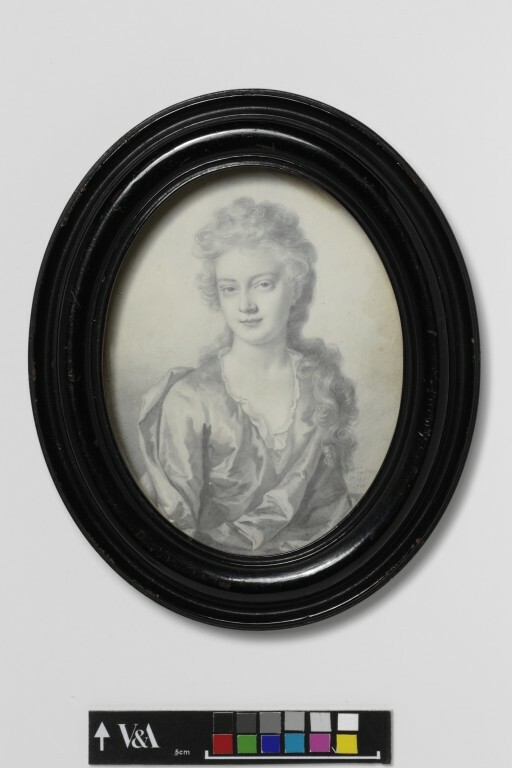 Portrait miniature of Lady Anne Churchill, dated 1700, graphite on vellum, drawn by Thomas Forster (fl. 1690-1717).